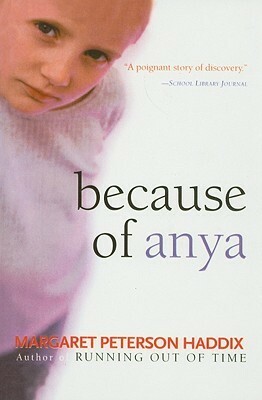 Because of Anya is a short story that my fifth grade son's teacher read to the class. My son was in and out of school for the better part of a week and ultimately spent four days in the hospital before we got him back on track. He is doing great now, but he was behind on this assignment and needed to catch up, so we read this book together. The story is told from both Anya and Keely's point of view. The girls are in fourth grade and have been in the same class since kindergarten. They aren't close friends, but they have played together at school for almost five years. One day, Keely's friends notice that Anya is wearing a wig and assume she must have cancer. They are concerned about her, but don't know how to handle the situation. We discover that Anya actually has a condition known as alopecia areata, which is an allergic reaction to her own hair. We see how Anya and her family cope with the situation and the fears they experience. I was not aware of this condition prior to reading the book. The story is very informative and a great way to broach the subjects of illness, empathy, and compassion with young readers. My son could easily relate to the story since the characters are close to his age. He understood how something like this could happen to him or one of his friends and the importance of supporting one another. I was originally concerned that it would be sad and depressing, but it wasn't. I would definitely recommend sharing and discussing this book with middle grade children.